I have reached 1,000 Likes on Facebook and as a huge THANK YOU to my followers, I am having a giveaway! Yay! 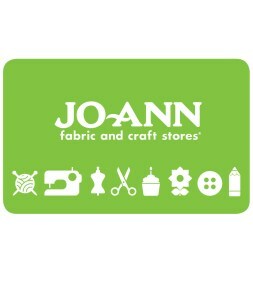 I am giving away (1) $20 Gift Card to JoAnn fabric and craft stores! The giveaway is open world-wide and the winner will be chosen on September 22, 2017. To enter the giveaway, use the Rafflecopter form below and also head over to my Facebook page and earn some extra entries by liking, sharing, and commenting on the giveaway post! I am solely responsible for this giveaway. I will personally mail you the gift card if you are the winner. Facebook and JoAnn fabric and craft stores are in no way affiliated with this giveaway. I just want to celebrate my Facebook milestone with a fun giveaway as my way of saying thank you for being such wonderful followers! How fun! Thank you! Love your patterns! Your patterns are so cute and creative. Congrats! Congrats on the 1,000 likes with more to come. I love what you do! We are a Disney family! One of my favorites I Belle! Thank you for the opportunity and best of luck to everyone!! My favorite Disney character is Winnie The Pooh! I love your patterns! Pluto is my favorite Disney character – though I LOVE your Toothless inspired cozy pattern and Dumbo (huge dog & elephant fan here). I have a close friend who is a BIG Disney fan and a devoted coffee drinker as well – she loves all the cozies I have made her from your patterns – thanks so much for sharing! Thanks for the chance to win too! Congrats on 1000 likes. My favorite Disney character is Donald Duck! Thanks for the chance! Eeyore is my favorite Disney character! He’s just so cute! I love Pluto and Mickey Mouse! Congrats on 1,000 likes! My favorite Disney character is Mulan. My favorite Disney character is Belle from Beauty and the Beast.